"It's the perfect night out"
After several successful stints off-West End, circus extravaganza La Soirée finds a home in the refurbished Aldwych Theatre. It's an odd environment for the usually intimate experience, and it does lose the heady atmosphere of the Spiegeltent. However, the show quickly reminds us of its draw with a fast-paced offering of jaw-dropping acts. 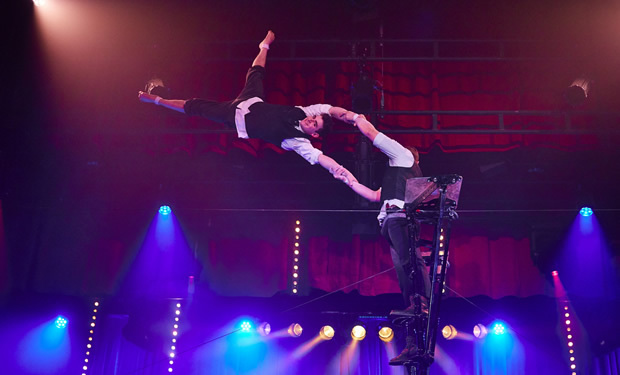 With talent from across the globe, La Soirée offers up different acts each time it returns for a new season. And although the compering and 'distraction games' fall a little flat when viewing from the circles, the spectacular talent finds its way up to the gods, showcasing some phenomenal treats. There's a real mix to the night, which chugs on very nicely. From the enchanting aerial displays from Lea Hinz, LJ Marles and The Chilly Brothers, to the disgusting-but-hilarious offerings from Daredevil Chicken, there's a real feeling that anything can happen in this traditional West End theatre. The group dub themselves as a “dysfunctional family”, and it's true, as everyone is incredibly different, but the connection between them is apparent and strong. It's the perfect night out; different from any other show currently on the West End. But does it quite work in the extravagant Aldwych Theatre? Shouldn't a show like this be encased in dry ice, tent flaps and thumping music? Whilst the sound does pump its way out, you still feel a little distanced from the action, particularly when the bars are far away and would require the whole row to stand up if you wanted a tipple. Luckily, the talent itself is so mesmerising that you quickly forget you even want a gin and tonic. Particular treats are the sensual dancers and gymnasts Leon and Klodi, whilst Michele Clark showcases some spectacular hoop tricks. It's everything you would expect and a little bit more. La Soirée is brilliant, it's true. But I would recommend seeing it when it returns to the intimate, atmospheric Spiegeltent. 4 December 2017 - "It's the perfect night out"